The 2 days private Uganda tour takes you to Lake Bunyonyi; a hidden African Jewel characterized with beauty seen in over 29 islands, pleasant climate and a perfect spot to relax and chill on this Uganda safari tour. Lake Bunyonyi extends northwards from the Rwanda border over a distance of 25kms through the contours of the steep hills that separate Kabale and Kisoro districts. Lake Bunyonyi covers a distance of about 60 square kilometers. This lake is also known as the deepest lake in Uganda; over 900 meters deep. As part of your adventure as active travelers on Uganda safaris to Lake Bunyonyi Uganda are catered for with different activities like canoeing, boat cruise, nature walks, biking and bird watching for those interested in Uganda birding safaris. Your accommodation in Lake Bunyonyi will depend on your choice ranging from luxury, budget and mid range. 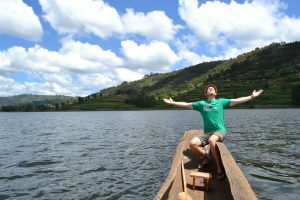 Day 1: Transfer from Kampala to Lake Bunyonyi for a boat cruise on the lake visiting the island communities. Wake up early for breakfast at your hotel and get ready for the journey. You will be picked up by our Uganda safari guide who will take you through a short briefing about your 2 days Uganda safari trip to Lake Bunyonyi Uganda. You will then transfer to southwestern Uganda to Kabale district for your night. On your way to Lake Bunyonyi, you will make a stop over at the equator for a polar water experiment, photos, and take a look at the art pieces made by people. There is also a lot of African crafts on display. You may also purchase some souvenirs for yourself. After the equator tour, you will embark on your journey to Mbarara at Igongo cultural center for your lunch then travel straight to Kabale for your overnight at your hotel as planned. After breakfast at your hotel or lodge, you will be picked by your safari guide and transfer to Lake Bunyonyi where you will do a boat cruise in over the 29 islands. the word Bunyonyi means place of little birds and Lake Bunyonyi is home to over 200 species of birds. during this boat cruise, you will see quite a number of birds like the grey crowned crane, red-chested sun birds, and many flycatchers. Your guide will also tell you a lot of stories about Lake Bunyonyi including the Akampene punishment Island. You will then return to your lodge in the afternoon and for Lunch, check out and start your journey back to your hotel in Kampala. Drive to Lake Mburo National Park for a simple game drive on your way to Kampala.